This text was originally published for use in courses at The Ordnance School. Today, some sixty years later much of this information is style very useful. 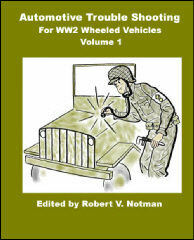 The beginner will find it helpful in trouble shooting the WW2 vehicle and even the experienced mechanic might learn a thing or three! 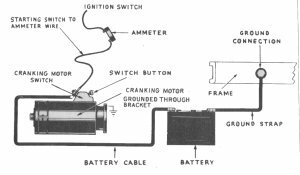 For your reading pleasure, a few teaser pages extracted from my book Automotive Trouble Shooting For WW2 Wheeled Vehicles. This preview includes a 20 page look (of 113 page total!) at the contents of the book. Please note the file is 1.5MB which hopefully will give you a warning as to how long it might take you to download the file. 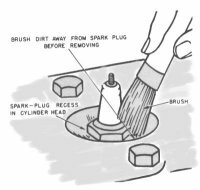 Cleaning the spark plug recess before removing plug. 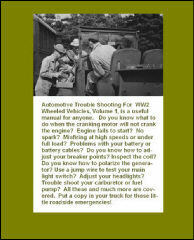 If you would like a copy of the Automotive Trouble Shooting For WW2 Wheeled Vehicles, Volume 1. Also check out Volume 2! for even more great WW2 information.